And another two weeks have passed in which I've been absolutely too busy to leave the writing desk (you'll learn why fairly soon), but I have some news this morning. 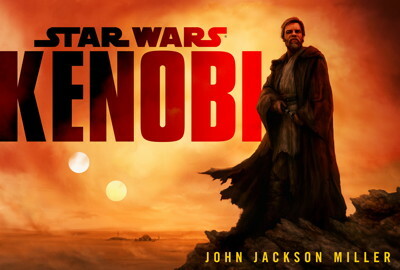 Del Rey announced that my new Star Wars: Kenobi novel is now releasing August 27, a month before the originally scheduled ship date. The e-book release is also that day; I'll post the link to it when it becomes available for preorder, in the meantime, you can preorder the hardcover from Amazon, Barnes & Noble, Random House, and IndieBound. You can also preorder the audiobook from Amazon and Barnes & Noble. Road-trip listening alert! An order page for an unabridged audiobook for Star Wars: Kenobi has been added to Amazon. It's set to release Sept. 24, coinciding with the hardcover, which can be preordered here. No further details, but they are soon to come, I am sure.